The atmosphere in the Navona Charming Flat reflects peace and quietness, even though you are in the middle of most vibrant and beautiful part of Rome. The Piazza Navona’s neighborhood is the only place where you can really feel the atmosphere of ancient Roman civilization and you can walk by touching and feeling the beauty of the monuments, squares, fountains and one of the most beautiful historical palaces of Rome where the apartment is located. Beyond the antique massive wood door of the historical building you will find the entrance hall where centuries ago the horses and the carriage went through to a Renaissance courtyard. 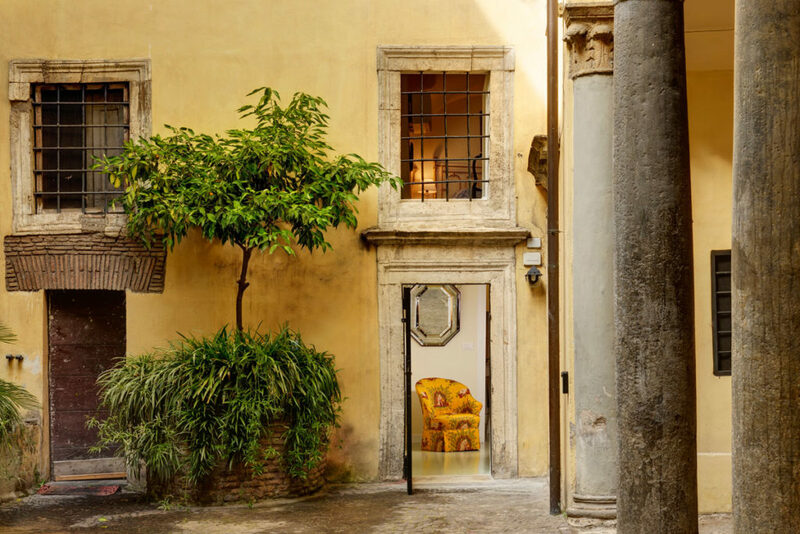 In this courtyard, close to an antique fountain and a generous-in-fruits-and-fragrant-flowers orange tree, stands the iron gate to access the apartment. The self-catering apartment, on two levels, is very quiet and light, and has recently been restructured and furnished elegantly with antique furniture which has been in my family for generations. The interior is made up of a good-sized living room with a sofa-bed, a completely furnished kitchen, and a bathroom with shower. On the upper floor, there is a double-bed with an additional single bed, and a bathroom with tub and shower. It comes with Air Conditioning, Free Wi-Fi, Satellite TV, Dishwasher, Washing Machine and Iron. The apartment can accommodate up to 5 people.